Depart Detroit or Chicago on an evening flight to Rome. You will arrive mid morning on Saturday, September 16, 2006. Saturday 16 September: Welcome to Italy! Isabella and Luigi, our hosts, will meet us at Leonardo da Vinci Airport, Rome. 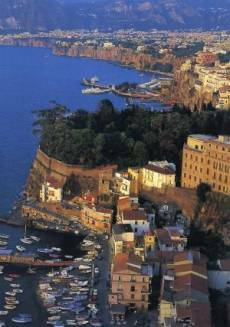 Our coach will transfer us to the stunning Sorrentine Peninsula where we will stay in the heart of Sorrento for 2 nights. You may like to rest after your flight, so no formal activities are planned today. As it is Saturday attractions and shopping in Sorrento are open. Some shops may be closed on Sunday (not all) so you may like to explore the narrow lanes around our hotel which hide delightful boutiques. You may prefer to sip a glass of wine, soaking up the atmosphere. This evening we’ll sit down to a delicious dinner. Overnight ***Hotel in Sorrento. Breakfast and Dinner with wine included. 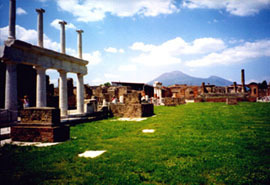 This morning, for those who wish to come, Isabella will take you on a visit to the archaeological site of Pompeii. This is one of Italy’s most important sites, but more than that, it reveals how the city was buried when Mt Vesuvius erupted in 79 AD. In the afternoon we’ll travel the road which winds round and cuts into the coastal cliffs between Positano and Amalfi. Breathtakingly beautiful, the Amalfi Coast never fails to enthral. There’ll be time for a stop at Positano and Amalfi. Pizza dinner this evening. Overnight ***Hotel in Sorrento. Breakfast and Light Pizza Dinner with wine included. We’ll depart Sorrento and our coach will transfer us to our hotel in Rome where we will stay for 3 nights. Once we have checked into our rooms we’ll begin our discoveries of this amazing city so that you can acquaint yourself with your surroundings. This afternoon Isabella will take you to visit the Trevi Fountain, the Spanish Steps and the famous shopping street Via Condotti. This afternoon and evening is for sightseeing and orientation so that you can plan your own itinerary for the coming two days. Overnight***Hotel in Rome. Breakfast. This morning is devoted to discovering ancient Rome. You may like to come with Isabella to visit the Coliseum, to walk through the Roman Forum, Capital Hill designed by Michelangelo, the Vittorio Emanuel monument and the Pantheon, Temple to all the Gods. 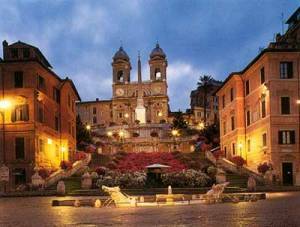 We will be in the heart of medieval Rome and you are surrounded by delightful choices such as Piazza Navona or Campo di Fiori, or the wonderful shopping. You will be free for the rest of the afternoon, but Isabella will be on hand to give you any help needed. This evening we’ll gather at a trattoria for a dinner of pasta and dessert. Overnight***Hotel in Rome. Breakfast, Light Pasta Dinner with wine included. Crossing the River Tiber we’ll make our way to Vatican City to visit Saint Peter’s Basilica and the Sistine Chapel. In the afternoon, your last day in Rome, you will be free to visit any of the wonderful museums, or to indulge in last minute shopping and sightseeing, and perhaps one more gelati in Piazza Navona! This evening we’ll dine locally, cafeteria style, relaxed and informal. 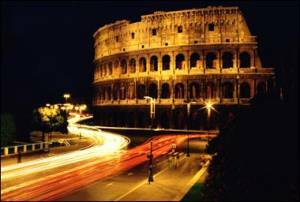 Overnight***Hotel in Rome. Breakfast, Cafeteria style dinner with wine included. The town of Orvieto, visible for many miles distant, sits on a plateau above a huge rock of tufa. It is one of Tuscany’s most enchanting places with an astonishing mosaic covered Cathedral in which we’ll find a cycle of frescoes by Luca Signorelli. Some things are not to be missed – this is one of them. You’ll have free time to investigate the ceramics for which Orvieto is famous. After lunch we’ll depart to San Gimignano where we will stay for 3 nights. San Gimignano is on the tourism trail, but it is always enchanting, even if it is busy – once seventy stone towers graced the skyline of this village, but the onset of the plague in the 1300’s drove the population away and it lay abandoned, captured in time. 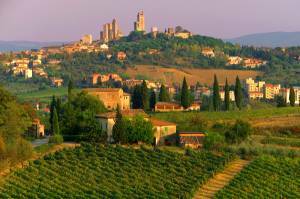 You can spend the rest of the day exploring San Gimignano. We’ll have dinner in our hotel this evening. 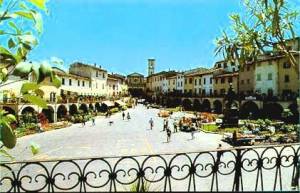 Overnight***Hotel in San Gimignano. Breakfast and Dinner with wines included. Our day will be broken into two halves so that if you prefer, you can spend more time in San Gimignano. For those who would like to join her, Isabella will lead you on a morning visit to the enchanting wine village of Greve in Chianti. As well as the chance to meander around the village and enjoy the ambience, we will also visit a marvellous wine cellar for a fun and experimental wine tasting of Chianti wine. In the afternoon we’ll travel into Florence for our afternoon/evening visit. Isabella will lead you on an orientation walk to the Cathedral, Baptistry, Piazza Signoria and Ponte Vecchio. You may like to eat dinner early in Florence. Overnight***Hotel in San Gimignano. Breakfast. 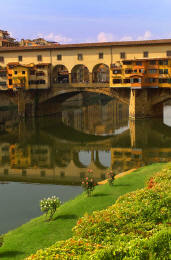 Today is devoted to the Renaissance city of Florence. You are familiar with the city and can plan your own itinerary. Some people may like to go to the markets, to shop, and some may like to come with Isabella to the sculptural work of Michelangelo, and to the Uffizi gallery to see the works of Masters such as Giotto, Piero della Francesca, da Vinci, Botticelli and Michelangelo. We will have pre booked entry times for both galleries and Isabella will guide you to selected works. You can visit Santa Croce or Santa Maria Novella or the Boboli Gardens and Pitti Palace. There is no shortage of things to do – and don’t forget a Campari in the piazza. After a full day we’ll have dinner in our hotel. Overnight***Hotel in San Gimignano. Breakfast, Dinner with wines included. This morning we’ll board our coach and travel on the autostrada through the Appenine Mountains until we are on the mainland facing Venice. Arrangements are in place for your baggage to be taken by boat to the closest landing to our hotel. 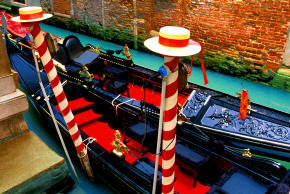 You will also travel by boat, collect your baggage, and go directly to our hotel for check in. We’ll begin exploring this amphibious city this afternoon, walking to the Rialto Bridge, Piazza San Marco, the Basilica of Saint Mark and the Palace of the Doge. 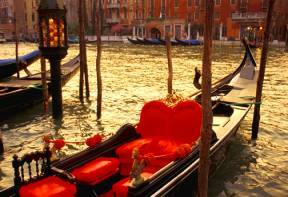 A fabulous walking tour will orientate you with Venice and our hotel. This evening we’ll have dinner in a trattoria. This is your last day with Isabella and Luigi who return home tomorrow morning, but you will have the whole day tomorrow to enjoy Venice and all her bizarre, fabulous and exciting sights and shopping. Overnight**Hotel in Venice. Dinner with wine included. Monday 25 September: Now that you are familiar with Venice you have the whole day at your disposal to get to know Venice and to absorb the atmosphere of this incredible city built upon the water. Wandering among the alleys, over bridges and by the side of quiet canals is the most atmospheric of ways to understand Venice and to feel her past history and power. Some guests will return home today, others may choose to remain in Venice, and some will continue their vacation in Umbria. Departure arrangements are at your own arrangement and expense. and phone numbers and created an HTML document from it.